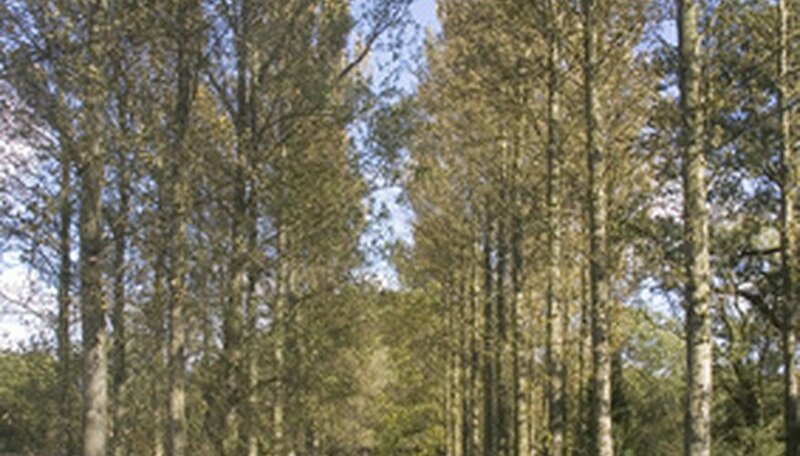 Poplar trees have a long, lean form, often growing in an oval shape. They are fast growers, often gaining 5 to 8 feet per year, according to Arbor Day. While mature trees reach 40 to 50 feet in height and can be challenging for a homeowner to prune, young trees can be readily pruned without professional help. Prune poplar trees in the late winter to early spring once frost danger passes for your region. Use a ladder to ready tall branches if necessary. Look for dead, diseased or damaged branches on your poplar tree. These need to be removed for the overall tree health. Dead branches don't move in the wind. Diseased or damaged branches often have wounds, discoloration, scars or other cosmetic damage that can be easily noted. Prepare a sanitizing solution of one part bleach to 10 parts water in a bucket. Place your pruning tools in the bucket. Prune off dead, diseased and damaged branches. Use anvil pruners for cuts thinner than 3/4 inch and lopping shears for thicker ones. In between each cut, re-wet your pruners in the bleach solution to disinfect them. Clip off low-growing branches that impede movement underneath the tree, as well as suckers growing off the trunk. Prune away branches that crisscross other branches, since their friction will cause damage later on. Remove thin, weak growth by cutting it off at the base. Prune back wood that makes less than a 30-degree angle with the trunk, since it grows too close in. Also cut away offshoots from branches that grow up, since they cast shade and obstruct the tree's form.